Vegan restaurants have branched out beyond legumes and fried tofu. You can now find meat-free barbecue, burgers, even mac and cheese. The vegan food scene in Dallas has skyrocketed over the past five years. We’ve evolved past legumes and seaweed and fried tofu (although, those things are still fun to eat) and have reached a new, robust, adventurous, even, state of plant-based dining. There is Tex-Mex and bakeries and late-night options. There’s American comfort food and Chinese and Thai. It’s no longer just in Uptown and Oak Lawn, either. Restaurants span from South Dallas to East Dallas. There are plenty of vegan options to choose from, so get to it. This Trinity Groves restaurant, run by chef-owner Troy Gardner, specializes in plant-based comfort food. You can get a taco salad loaded with Impossible crumble. You can also get a chili cheese dog. What we really dig, though, is the charcuterie. Yes. A meat and cheese board. At a vegan restaurant. Gourmet vegan cheese, although steadily gaining momentum, is difficult to come by in certain markets, but V-Eats is making their own in house. And it’s good. You can read all about it here. Five words: to-go plant-based food. Five more words: way fun meal-prep classes. And five more words: you should check it out. Sorry, that was terrible. I’m done. But yeah, this vegan spot, which is located in a Lake Highlands shopping center, is worth visiting. If only for the chocolate frosted peanut butter bars and cooking classes. Plus, they have a ton of gluten-free options. The only time I’ve had Kalachandji’s was out of a tupperware container at a friend’s house after a night of barhopping. (Hey, it’s my job to be as honest with you as possible.) I did enjoy spooning hunks of cold vegetable curry into my mouth, though. D Magazine dining critic Eve Hill-Agnus has been to the Hare Krishna temple and vegetarian restaurant (which offers vegan-friendly options that lean Indian) and she says: “Kalachandji’s is perhaps best known for its restaurant, one of the city’s treasured spots for vegetarian fare. Cooking classes, held in three seasonal sequences of eight classes per year, are another way they gently spread the gospel of vegetarianism.” Good food and cooking classes. There you have it. Dining options at this Cedar Crest restaurant are limited, but worth a try. Duh. That’s why they’re on this list. They also offer a juice bar with fresh-squeezed fruits and vegetables. We recommend the sweet and tangy pulled jackfruit sandwich, dusted with chile, onion, garlic paprika, and liquid smoked, squished between house-made apple-and-flaxseed bread. You can read more about it here. But honestly, just go try it for yourself. 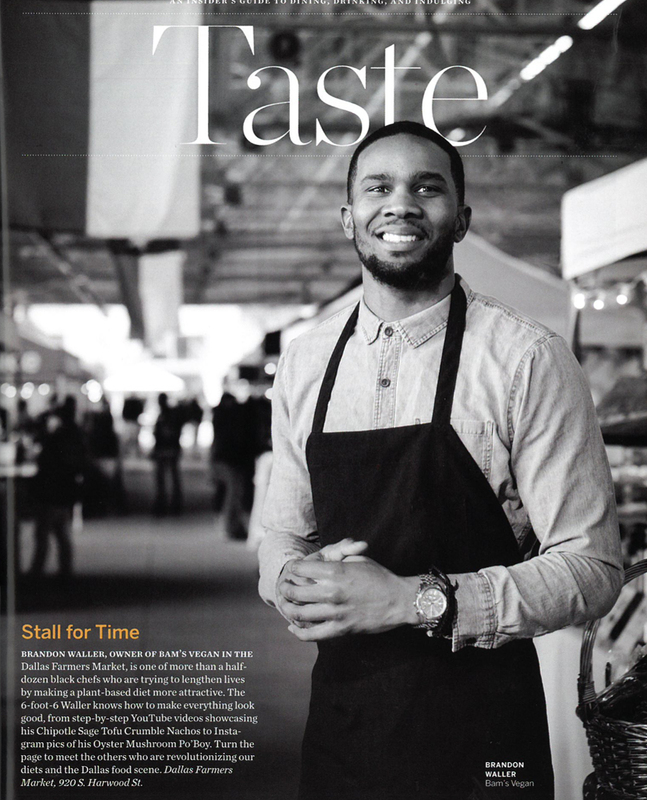 This spot, which located in the Dallas Farmers Market, is also featured in the April issue of D Magazine. Owner Jovan Cole specializes in meat-free Italian, Mexican, and soul food. Also featured in the April issue: Soulgood, a vegan food truck and catering company that serves things like peach cobbler pancakes and chili dogs, which is really a soy protein wiener topped with vegan chili. Find its schedule here. There’s also the Peace, Love, & Eatz Smoothie Bar in DeSoto that offers jackfruit sandwiches in addition to its smoothies. This Deep Ellum restaurant is a hit. A smash hit, some may say. The spot, from Oliver Peck, owner of Elm Street Tattoo and judge on reality TV show Ink Master, serves some of the best casual vegan tacos in town. They’re also blending up killer smoothies. Read more here. Vegan Mexican food. Yup. You read that correctly. People love this place. We love this place, too. Soy taco filling-styles include al pastor, bistec, and carne guisada. There’s also tortas, burritos, flautas, and enchilada. Bonus: there’s an on-site bakery.